Bikes Built To Do It All. And To Have Fun Doing It. We think motorcycles should be about getting out and enjoying the world around you. The sun, the smells, the wind, the weather. More reality and less virtual. And you know what’s even better? If you could find one bike that could do it all. Let you go exploring in the dirt. Zip along mountain roads. Commute to work every day. And even save you some money at the gas pump. Well, guess what—the CRF250L and new CRF250L Rally are going to be the perfect bikes for all those things. First, the CRF250L: We’ve given it some great new updates for 2017. Some highlights: A larger throttle body improves the feel of the bike’s low- and mid-range power, as does the new muffler design, revised airbox, and larger diameter exhaust header. And check out its new graphic treatment, matched up to our CRF450R MX bike. 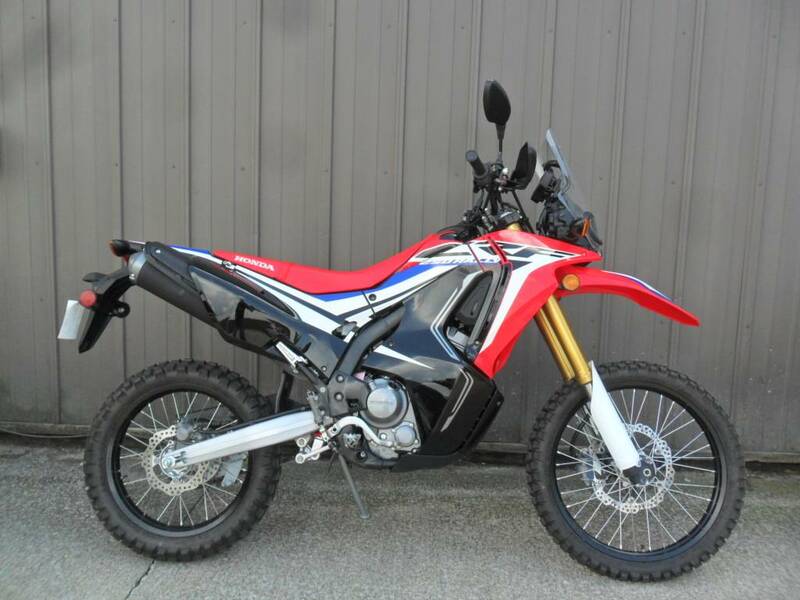 The all-new CRF250L Rally gets the same updated engine as the standard 250L, but it also gets a larger fuel tank, totally new Dakar-style bodywork, handguards, a windscreen, skid plate and even more suspension travel. And both give you a great upright seating position that’s comfortable for longer rides, ideal for both urban traffic or out on the trail. They’re even available with optional ABS. FUEL INJECTION: Fuel injection means the CRF250L models start right up, even in cold weather. Compared to a carbureted bike, it also helps reduce emissions and enhance performance and fuel efficiency. And for 2017, a larger throttle body improves response and power. DIGITAL INSTRUMENTATION: The CRF250L's digital instrument cluster is new for 2017. Integrated with the headlight visor, it gives you all the information you need: Speedometer, clock, twin tripmeter, fuel gauge, and more. The CRF250L Rally’s digital instrument cluster tucks in behind the rally-style windscreen, just like the big Dakar bikes. RALLY-BIKE STYLING: The tall windscreen, the extra-coverage fairing and sidepanels, the blended, frame-mounted bodywork are all marks of a true rally machine. The new 2017 CRF250L Rally looks great, but you’ll appreciate the extra wind- and weather protection too. DISC BRAKES: The CRF250L models feature front and rear hydraulic discs for excellent stopping power and brake feel, both for on-road and off-road use. TBD MPG - Honda's fuel economy estimates are based on EPA exhaust emission measurement test procedures and are intended for comparison purposes only. Your actual mileage will vary depending on how you ride, how you maintain your vehicle, weather, road conditions, tire pressure, installation of accessories, cargo, rider and passenger weight, and other factors.